Field line resonance (FLR) has been the theoretical mechanism used to explain a myriad of ground and spaced based observations of ultra low frequency (ULF) waves in Earth’s magnetosphere. FLR is a plasma physics process whereby energy from a global oscillation (fast mode) can be transferred to local oscillations along magnetic field lines (Alfvén mode), where the fast mode frequency matches the local Alfvén frequency. This process was first studied analytically where the plasma was only inhomogeneous in the radial direction (mathematically 1D) [Southwood, 1974, Chen and Hasegawa, 1974] and has since been extended both analytically and numerically to more complicated systems [e.g. Lee and Lysak, 1989, Chen and Cowley, 1989, Wright and Thompson, 1994, Russell and Wright, 2010]. A feature of FLRs in complicated geometries, such as a dipole, is that the poloidal (radial) and toroidal (azimuthal) Alfvén frequencies are different [e.g. Radoski, 1967]. This infers that the location where the FLR will occur is dependent on the polarisation of the Alfvén wave. This property has recently been explored theoretically in 3D [Wright and Elsden, 2016] and forms the basis of this current work. The magnetosphere is asymmetric and therefore requires an understanding of FLR in 3D. We look at wave coupling in an excessively asymmetric waveguide in order to study the physics clearly. 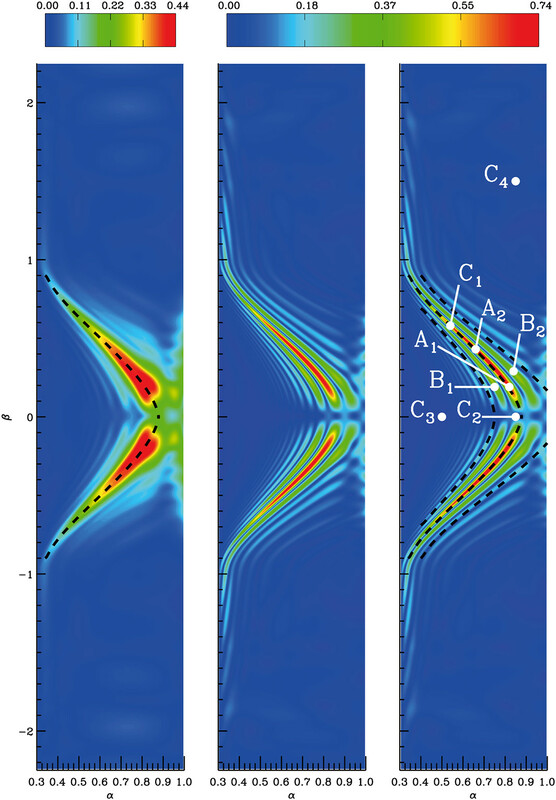 The figure below taken from Elsden and Wright , displays cuts in the equatorial plane from a 3D MHD waveguide simulation using a 2D dipole magnetic field geometry. In each panel, the x-axis is the radial direction (α) and the y-axis the azimuthal direction (β), and the density varies with azimuth. The left panel shows the energy density (dimensionless units) integrated along a field line, showing an accumulation of energy along curved resonance paths, where the FLR polarisation is between poloidal and toroidal. The middle and right panels show the square root of the kinetic energy in the equatorial plane, revealing ridges which develop by phase mixing in 3D. We find that with a broadband driver it is the natural fast waveguide modes which drive FLRs. Such modes are fairly insensitive to the form of the driver, and hence the resonances are seen at the same locations for many different driving stimuli. This means that the resonances are a property of the medium, and can hence be used as a seismological tool to infer properties of the equilibrium. Finally, the key point is that traditionally FLRs are regarded as having a strictly toroidal polarisation. However, here we have shown in 3D that they can have other polarisations. Figure: Left: Energy density integrated along a field line. Black dashed line represents a theoretical prediction of the main FLR location. Middle: Square root of the the kinetic energy in the equatorial plane. Right: Same as middle but annotated for use in other plots in the paper. The aurora borealis, though most often visible from more northerly latitudes, can occasionally be seen from the UK too. To help the public in their endeavour to see the northern lights from the UK, Lancaster University’s AuroraWatch UK issues alerts of when the aurora might be visible. As the currents driving the aurora intensify, they produce disturbances to the local magnetic field. Since its inception in September 2000, AuroraWatch UK has been using its own suite of magnetometers to record these disturbances and issue real-time alerts about where in the UK an aurora might be seen. We have now combined and standardised these alerts, using the latest alert algorithm to produce a 17-year dataset of UK aurora alerts. This dataset, along with the real-time data, is freely available for the community and the general public to use. We find that the alerts match well with the wider Kp index and the solar cycle. (left) A pie chart illustrating the number of hours spent at each AuroraWatch UK activity level, as a percentage of the total number of hours. (right) A histogram of the percentage of hours spent at an elevated alert level (i.e., yellow or above) per year. Also plotted are (solid line) the percentage of time per year where Kp ≥ 4 and (dashed line) the mean daily sunspot number per year (as a proxy for solar activity). The sunspot number is divided by 10 for scale. Nugget: Are steady magnetospheric convection events prolonged substorms? The large scale convection of magnetic flux within the Earth’s magnetosphere due to reconnection, also known as the Dungey cycle [Dungey, 1961; 1963], is partially driven by the solar wind. During southward IMF reconnection at the subsolar magnetopause opens flux, which is then added to the magnetotail. Depending on the strength of solar wind-driving, the magnetospheric response can be delayed, episodic or prolonged, also known as “magnetospheric modes” [e.g. Pulkkinen et al., 2007]. 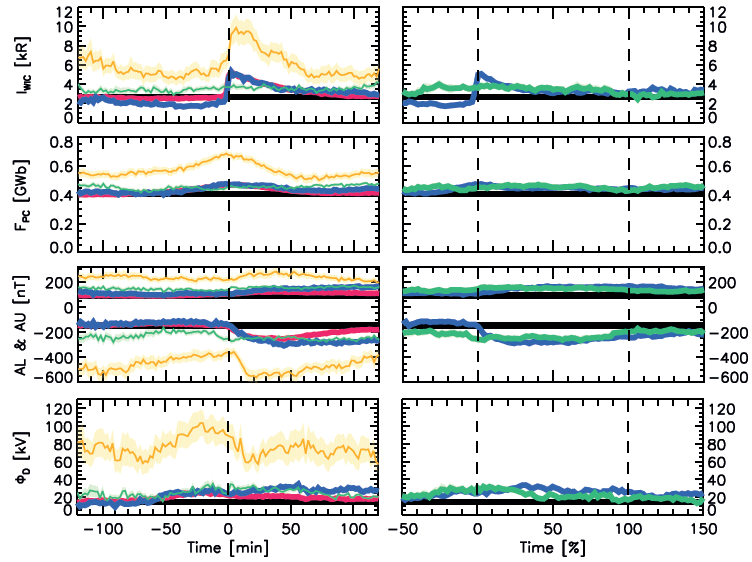 Walach and Milan  produced a statistical analysis of the event progression of steady magnetic convection events (intervals where the dayside reconnection is balanced by nightside reconnection [e.g. DeJong et al., 2008]), substorms (dominant dayside reconnection is followed by a delayed interval of dominant nightside reconnection [e.g. Baker et al., 1996]), and sawtooth events (signatures appearing to be quasi-periodic and quasi-global substorms [e.g. Henderson, 2004]). Superposed epoch analyses show that 58% of the studied steady magnetospheric convection events are part of prolonged substorms, where dayside reconnection is at first dominant. Then nightside reconnection is initiated as part of a substorm, but as the solar wind-driving continues the Earth’s magnetosphere then progresses into a state of steady magnetospheric convection, after which the substorm recovery continues. Walach, M.-T., S. E. Milan (2015), J. Geophys. Res. Space Physics, 120, doi:10.1002/2014JA020631. Superposed epoch analysis of substorms (red), sawtooth events (orange), steady magnetospheric convection events with preceding substorms (blue) and steady magnetospheric convection events without preceding substorms (green). The onset of the steady magnetospheric convection events with preceding substorms has been shifted to match the preceding substorm onset. The time of the event duration for the steady magnetospheric convection events in superposed epoch analyses in the right column has been normalised. During southward IMF reconnection on the dayside leads to a build up of magnetic energy in the tail. As flux is piled into the tail the configuration becomes unstable leading to an explosive release in magnetic energy, termed a substorm. The rearrangement of the magnetic field is accompanied by highly dynamic substorm aurora. The relatively high temporal and spatial resolution of the THEMIS mission All Sky Imagers have allowed recent observations of small scale azimuthal structures, auroral beads, which form in the minutes leading to auroral onset [e.g. Rae et al., 2009]. Conjugate observations in the Northern and Southern hemisphere suggest that the beads have a common magnetotail driver and are the ionospheric signature of a magnetospheric instability [Motoba et al., 2012]. Kalmoni et al. statistically analyse the growth and spatial scales of clear signatures of auroral beads observed in the minutes leading to substorm onset. The statistical observations are compared with the Shear-Flow Ballooning Instability (SFBI) [Voronkov et al., 1997] and the Cross-Field Current Instability [Lui, 2004 and references therein] which have both been proposed to play a role in substorm onset. Our observations conclude that the SFBI initiated in the near-Earth plasma sheet is the most likely explanation. Kalmoni, N. M. E., I. J. Rae, C. E. J. Watt, K. R. Murphy, C. Forsyth, and C. J. Owen (2015), J. Geophys. Res. Space Physics, 120, doi:10.1002/2015JA021470. 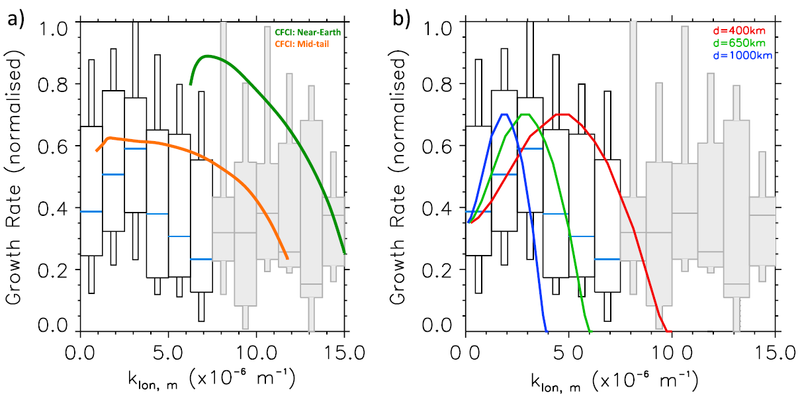 Normalised growth rate as a function of spatial scale in comparison to (a) the Cross-Field Current Instability for inner-edge and mid-tail plasma sheet parameters and (b) the Shear-Flow Ballooning Instability for varying shear-flow widths.